Have you accidentally taught your kids that it’s fine to ignore you until you’re yelling? Years ago I was in a child care situation where a number of the adults raised their voices at the kids in order to get their attention. One day a leader from a different group came to visit. 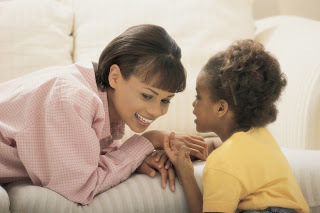 When she called the children together for circle time, she kept her voice soft. Actually, the kids had to quiet down to hear what she was saying. Guess what? Her quiet voice actually got much better behavior from those kids! A mom told me this same technique worked like magic with her kids. She typically shouted orders at them to get them ready for bed each night. Tired of her own yelling, she decided to try out whispering instead. That night when it was time to get ready for bed, she whispered to her children that it was time to get their pajamas on and go brush their teeth. They actually leaned closer to hear what she had to say! Even better, they went and got their pajamas on and brushed their teeth. Afterwards they all enjoyed reading a book together. Whispering got the message through more loud and clear than all her previous shouting. Yes, yes, yes! Want to get your child's attention? WHISPER - it works every time!